Learn from all your favorite TULA teachers! Join David Duerkop, Rhiannon Kirby, Monica Brown, Cassi Stuckman, Veronica Stevens, Kathryn Gongaware, Rachel Duerkop, Nathan Paulus and Michelle Beuscher as they will work as team to offer you one of the most comprehensive, unique and creative yoga teacher training programs out there. 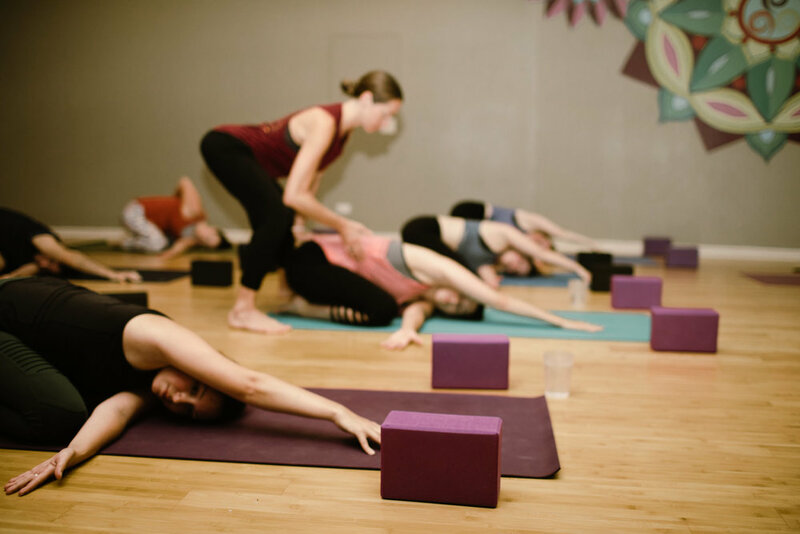 Because we are working as a team, all our teachers will be able to draw from their various experiences, years of education and differing backgrounds & perspectives to offer you a training that will allow you to truly find your own unique yoga path - whether as a student, a teacher, or something in between. We will weave eastern traditions and western practicalities into a modern and highly accessible approach to practicing and teaching yoga. TULA is a Registered Yoga School (RYS®) with the Yoga Alliance. This 200-hour program will encompass all the topics below and give you an excellent foundation for starting a career in yoga as a part-time or full-time yoga teacher. - Addressing and effectively teaching to specialized populations: Prenatal, Larger Bodies, Yoga for Trauma, Yoga for Anxiety, Seniors. - Opportunity to participate in additional yoga related practices: Thai Bodywork, Yoga Nidra, AcroYoga, Kid's Yoga, Yin Yoga and more. - Final Exam: Anatomy/Physiology written exam, History & Philosophy take home exam and 1 Final Teaching practicum. *cost of books/supplies is not included in the tuition prices, estimated at $150. $500* (non-refundable) deposit holds your spot! Remainder due must be paid in full by the first day of training. *This cost also includes an unlimited membership at TULA for the entire length of the program and a TULA Teacher Training Manual. Reading list book costs is NOT included. 1. More than 30 days from first day of YTT is a full refund via original method of payment minus the $500 non-refundable deposit. 2. Less than 30 days prior to first day of YTT, studio credit minus $500 non-refundable deposit. 3. No refunds after the first day of training. 4. In event of illness or other cancellation, the student will be granted a spot in the next YTT. Yoga Teacher Training Program runs from Oct 2, 2019 - March 28, 2020. The training will take place every Wednesday evening, 7:30pm - 10:30pm and Saturday afternoons, from 1pm - 6pm + scheduled weekly practice and a 6-week apprenticeship.